Your car's engine and automatic transmission use radiator coolant to help keep them from overheating while in operation. This is done by using a series of coolers, lines and hoses which are connected to the radiator or will be located on the engine itself. 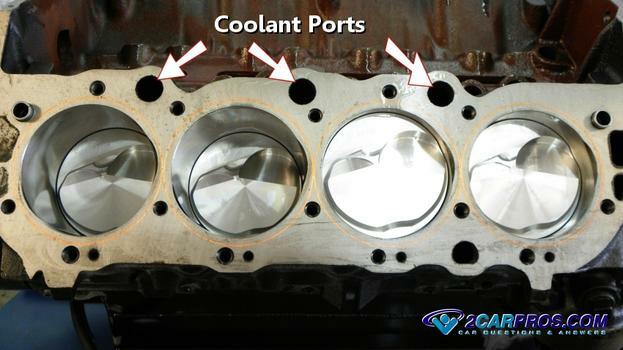 As coolant is transferred though the engine series of gaskets and seals are used to control the coolant from getting into internal parts where it is not suppose to be such as the engine crankcase. Also when a cooler fails it can leak oil into the coolant or coolant into the oil. When you start your car pressure begins to build up inside the cooling system, engine and automatic transmission. Engine oil, coolant and automatic transmission fluid are contained and cooled within the radiator and engine oil coolers. Because of engine vibrations and the constant expanding and contracting due to heat gaskets, seals and coolers can leak causing the coolant and oil to mix together which will cause the engine to overheat. This will depend on the problem. If the transmission cooler has failed inside the radiator then the expense will be to replace the radiator and to perform a transmission service which will run between $350.00 and $450.00 (US). But if you have a blown head gasket it will cost between $1200.00 and $2000.00 depending on engine size and the manufacturer. A worst case scenario would be to have a cracked engine block in which case the engine will need to be replaced which can run between $4,500.00 and $8,000.00 (US). It is important to know what kind of failure your car has experienced before jumping to any conclusions. Start with the engine cool and have your car parked on level ground. Its best to wear gloves and protective eyewear. 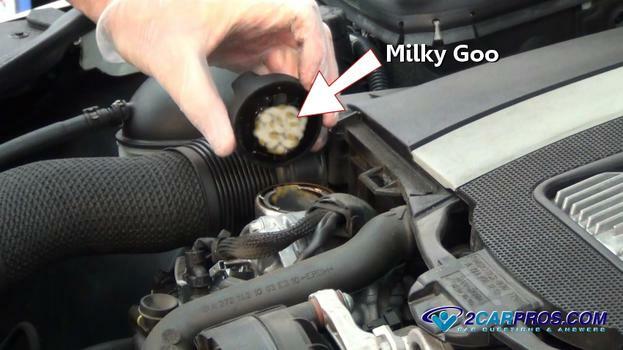 When coolant mixes with oil inside the engine it will created a milky goo or chocolate milk as some will call it which is a milky white or yellow colored oil. 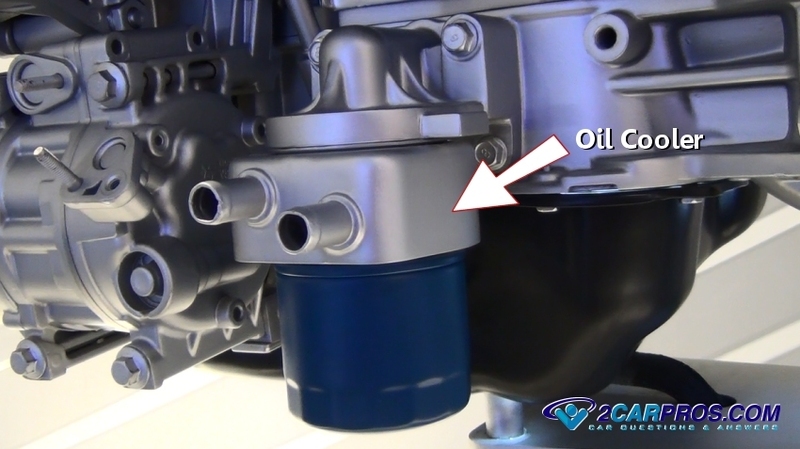 This can be seen when you remove the oil dipstick or the oil fill cap on the valve cover. 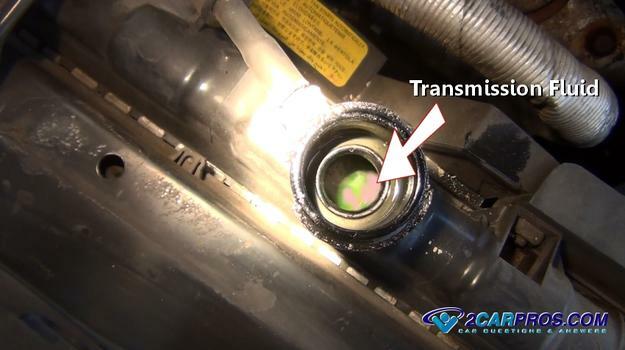 You can also use a flashlight to look inside the valve cover to further inspect for coolant in the oil. There could be a very slight amount of milky oil on the oil fill cap due to condensation but this will not be present on engines that are run on a regular basis. When this condition occurs the most likely cause it a blown head gasket. On V6 and V8 engine's the intake manifold gasket can leak allowing coolant down into the engine's crankcase and mix with the engine oil. To check for this failure the intake manifold will need to be removed and the gaskets inspected. Head gasket failure is one of the most common problems to allow coolant into the engine oil. This gasket seals the engine block to the cylinder heads and controls pressurized coolant and cylinder combustion. Due to heat and extreme pressures this gasket is exposed too it is prone to failure. 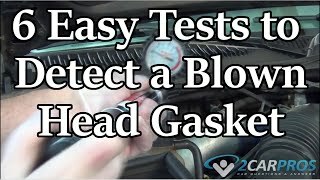 There are a few different tests to determine if the head gasket has failed. One of the more uncommon problems an engine can have is a cracked cylinder head or block. This usually occurs when the engine has been severally overheated and will allow coolant to enter the motor oil. To determine if this problem has occurred the engine must be disassembled and checked. The image below features the coolant ports in an engine block, the cylinder head is removed. There are two coolers used to help keep your car's engine and automatic transmission from overheating when in operation. Some engines are equipped with external oil coolers in which radiator coolant is passed through it to help keep the engine cool. When this cooler fails it will force motor oil into coolant and then circulated into the radiator. 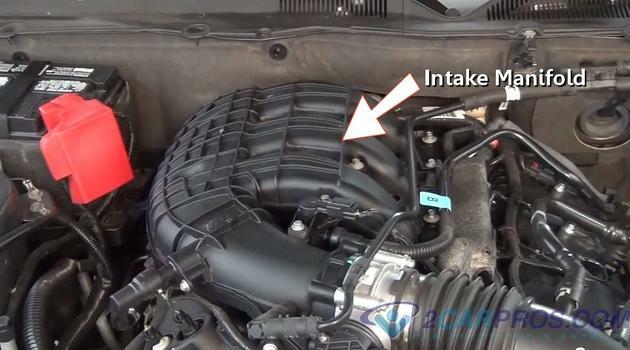 To check for this condition wait until the engine is cold and remove the radiator cap. You will see pools of motor oil inside the radiator. 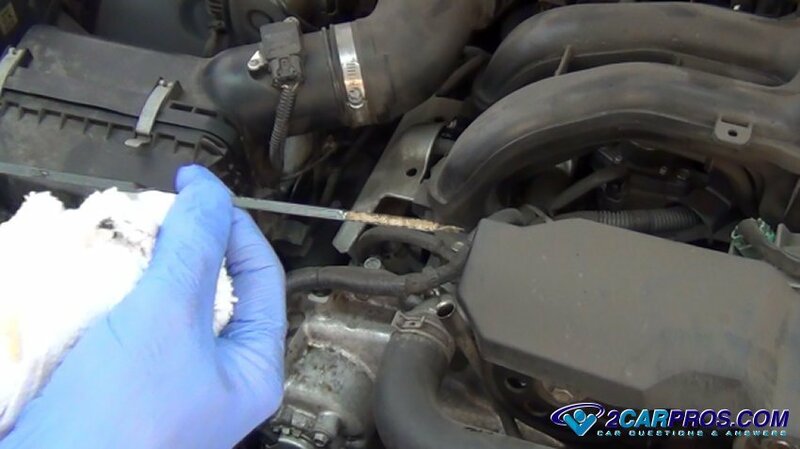 Additionally, this failure can cause coolant to enter the engine oil while the engine is shut off. This is because the cooling system is still under pressure even though the engine is not running. 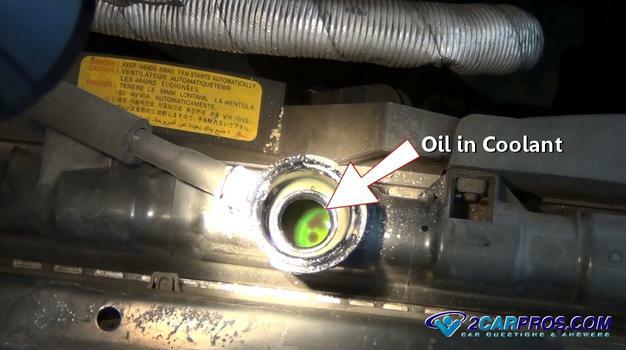 You might also see engine oil in the coolant reservoir as well. When this failure occurs the oil cooler must be replaced and the cooling system flushed. Transmission fluid is passed through a cooler located inside the radiator. This cooler is designed to keep the temperature of the hydraulic fluid under control. 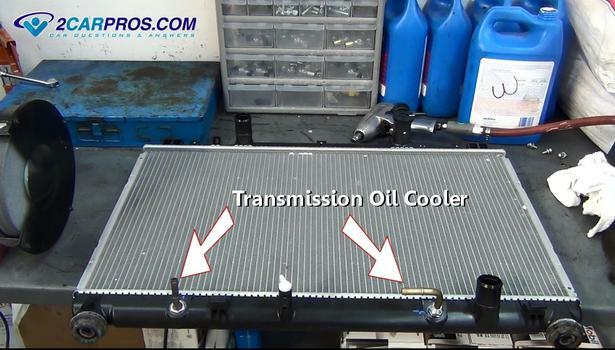 When this cooler leaks it will allow transmission fluid to flow into the radiator. This fluid will rise to the top which is then easily seen. This will cause the engine to overheat and the transmission to malfunction. 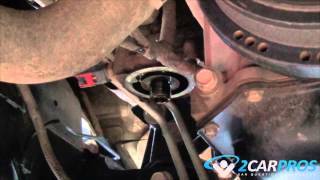 When this problem occurs the radiator must be replaced and the transmission fluid changed. Here is what the automatic transmission cooler looks like in the radiator. There is an incoming and outgoing fitting which the transmission fluid is allowed to enter and then exit back into the transmission. If you have any questions about oil in the coolant or coolant in the oil, please visit our forum. If you need car repair advice, please ask our community of mechanics who are happy to help. Our service is always 100% free.